A young couple were punched, kicked and burned in a terrifying revenge attack by a family armed with a knuckleduster, and a knife hidden in a tube of Smarties. Zoe Maitland, 21, is to be sentenced for the assault on her cheating ex and his new lover – in which her stepmother, her father and a friend all took part. Zoe repeatedly kicked and punched the woman – while her father Barry Maitland, 52, used a knuckleduster on his daughter’s former partner and also placed a lit cigar on his face, at a house in Kirkwall, Orkney, a court heard. Both victims said their mobile phones were taken from them and they were told their fingers would be broken if they tried to get them back. They were also warned they couldn’t leave – which legally constitutes abduction. Three of the four – Zoe, her stepmother Charmaine Sylvia Jane Maitland, 42, and Christopher Baird, 25 – admitted assault and abduction charges at an earlier hearing. Barry Maitland was later unanimously convicted of the same charges after a five-day trial at Kirkwall Sheriff Court, Orkney. They will all be sentenced at Wick Sheriff Court next month. 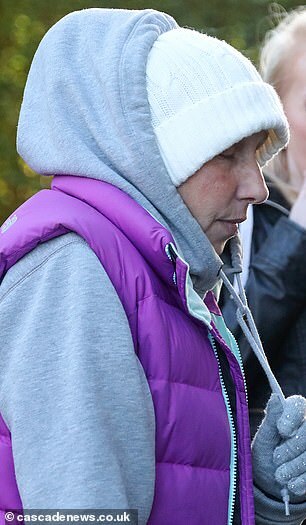 Charmaine was also involved in the ‘petrifying’ assault, as well as her stepdaughter’s friend Christopher Baird. All four arrived at the home which Zoe had shared on Orkney, north of mainland Scotland, with her ex until he ended their three-year relationship. Mr Maitland, from Aberdeen, placed a lit cigar on the face of his daughter’s ex, and produced a long-bladed knife from a large Smarties tube, the court heard in evidence. The victims, a couple from Kirkwall, said Maitland had arrived unexpectedly at the house on the night of April 21. Both told of their alarm when Maitland had produced a long-bladed knife from a large Smarties tube. Baird admitted forcing his way into the same address on the same date, and holding the man against his will, forcing him to the ground and repeatedly punching him on the head and body while wearing a knuckleduster. His plea of not guilty to a second charge of abduction and assault against the woman was accepted by the procurator fiscal. The sheriff said abduction could be constituted as an act of taking a person by force into another room within a home, and holding them there against their will. According to Maitland, his daughter Zoe had recently ended a three-year relationship. She had returned to the family home in Aberdeen for a few days, before returning to Orkney to begin ‘a new life’. The court heard that Maitland, his wife and daughter had arrived off the ferry in Kirkwall at around 11pm on April 21, and headed straight to his daughter’s fomer home to collect her belongings. Mr Maitland claimed the family were distressed to find that his daughter’s former partner was in the house packing up her things, having been asked not to do so. He claimed he arrived at the house to find the man shouting at his wife and daughter while brandishing a Hoover pole – accusations which the victims adamantly deny. Mr Maitland admitted slapping the man and pushing him against the wall in order to ‘calm the situation down,’ and later attempting to punch him, but he denied that the couple had been held against their will. Mr Maitland also denied accusations by procurator fiscal Sue Foard that an attack had been fuelled by a perceived mistreatment of his daughter, who he claimed had been in £15,000 worth of debt, because of her former partner. Zoe Maitland told the court that she had been made to sleep on a mattress in a damaged house and that her former partner had been claiming benefits in her name. ‘I was angry, but I never wanted to see him again,’ she said. But testimony from the victims and other witnesses who were with them following the incident painted a very different picture. The plan, they explained, had been for the Maitlands to collect Zoe’s belongings on Sunday, April 22, when neither victim would be at the property. Both victims said they had been shocked when the Maitlands had instead burst through the door on the Saturday night and attacked them. The man, who denied accusations by Maitland’s solicitor Michael Burnett that he had been making phone calls to Zoe’s doctor without her permission, said he had been ‘petrified,’ as he was dragged from the hallway into the bedroom. He said he had then been punched about the head and body with a knuckleduster by both Barry Maitland (also known as Baz) and Christopher Baird, who had arrived separately through the back door. The female victim, who recalled her terror as she was kicked and punched through the living room doorway by Zoe and Charmaine Maitland, broke down in tears, as she remembered hearing her partner screaming in pain from the bedroom. ‘Baz said that he would deal with [my partner], and that Zoe and Charmaine would deal with me, because he didn’t hit women,’ she explained. She said that her partner had then been brought into the living room, battered and bruised, where Barry Maitland placed duct tape over the man’s mouth and burnt his face with a lit cigar. According to the victims, Mr Maitland had then produced a knife from a tube of Smarties and proceeded to walk about the room. She was allowed to go, but had been too scared to contact police. ‘Baz said we could tell who we liked, but if he served time for it then they would come back and finish the job,’ she recalled. When released by the Maitlands, the couple said they had been too terrified to even go to hospital, and had to be persuaded by the sister of the male victim. There, a nurse had encouraged them to contact police, but they refused to provide a statement when they couldn’t be assured of their continued safety. Backing their story up was evidence found on a mobile phone taken from Charmaine Maitland by police, when she and her husband were seized from their Aberdeen home in June. A photograph on the phone, taken in the living room of the property where the incident occurred, was presented to the court. It showed the female victim sporting substantial bruising to her right eye. Although Mr Burnett highlighted a discrepancy in the date the photo had been ‘created’, according to its file date, Zoe Maitland gave testimony that she herself had punched the victim in the head on the date of the incident. 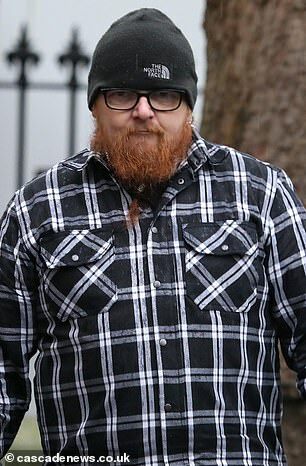 Zoe denied that her father had beaten up her former partner, despite messages sent by her to the male victim’s sister indicating that he had been ‘punched about a bit’ and that her father ‘went too far’. In her closing statement to the jury, Ms Foard reaffirmed her belief that the male victim was a reliable witness to the incident on April 21, despite his past indiscretions. ‘I think it is only fair to say that not a very pretty picture has been painted of the way [the male victim] treated women, and we have all given this some thought,’ she said. ‘But this is not a place for thinking about whether he was as good or bad as Mr Maitland. I think there are always two sides to a story. ‘In fairness to Mr Maitland, if that was his belief, then we know how you feel when somebody you care about is badly treated. If my daughter was being treated like that, I would behave badly too. But I wouldn’t go to a house and do what has been alleged. 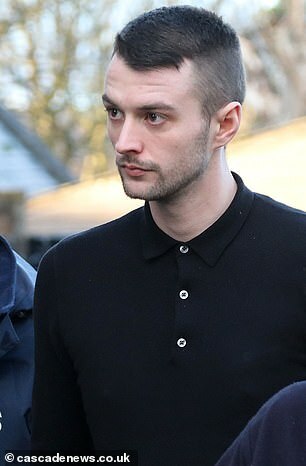 ‘[The male victim] held his hands up to the fact that his relationship with [the female victim] had started while he was still in a relationship with Zoe Maitland. Mr Burnett followed with his own closing speech to the jury. He proposed that the Maitland family had arrived early at the house because Zoe Maitland had feared that her animals were being mistreated, and that [the male victim] had shouted at and behaved aggressively to her and her stepmother before being subdued by a slap from Barry Maitland. He went on to dispute the reliability of both the victims’ testimonies, which he said were ‘difficult to square’ with the rest of the case. ‘I would suggest to you that [the female victim] has not been truthful,’ he said. ‘All this time, Mr and Mrs Maitland are going to appointments in Orkney. They are not hightailing it back to Aberdeen. ‘When the police come to their house in June, Mr Maitland lets them in. He doesn’t speak to a lawyer before his interview, he answers all the questions put to him. ‘You can take part of a witness’ evidence and accept it and reject another part of of a witness’ evidence. You are about to go to the jury room and you will be deciding what is going to happen. ‘Say I gave you a cake to help you in your deliberations – it’s 15 pieces, but some of the pieces are poisoned, I tell you. Do you take a chance with some of the pieces, or do you chuck the whole lot out? Zoe Maitland, of Kirkwall, and Charmaine Sylvia Jane Maitland, of Aberdeen, pleaded guilty to holding a woman against her will, after forcing their way into the property on the night of April 21. They admitted forcing the woman to the ground, repeatedly punching her on the head and kicking her, as well as throwing a number of items, including a toothbrush and medication bottles, at her. Their pleas of not guilty to a further charge of assault and abduction against a man were accepted by the procurator fiscal. Charmaine Sylvia Jane Maitland and Zoe Maitland have been released on bail. Christopher Baird, who is currently being held at HM Prison Grampian, admitted forcing his way into the same address on the same date, and holding a man against his will, forcing him to the ground and repeatedly punching him on the head and body while wearing a knuckleduster, presenting a knife at the man, placing duct tape over his mouth and burning him with a lit cigar. His plea of not guilty to a second charge of abduction and assault against a woman was accepted by the procurator fiscal. In their unanimous verdict at the conclusion of Barry Maitland’s trial last Friday, November 30, the jury chose to delete sections of the first charge, detailing the use of a knuckleduster and duct tape, as well as the presentation of a knife in the bedroom and the theft of around £30. In the second charge, they deleted a section alleging that the female victim was forced to the floor, punched and kicked on the head and body and had objects thrown at her. The section alleging how the group had forced their way into the house was also deleted from both Maitland’s charges. They are all due to be sentenced at Wick Sheriff Court on January 9.